Tyler Dorton has coached 3 all-state players and 7 all-conference players in 4 years. He’s worked hard on learning his craft and assembling a series of drills that allow him to accomplish much in a small period of individual time allotted to him in practice. 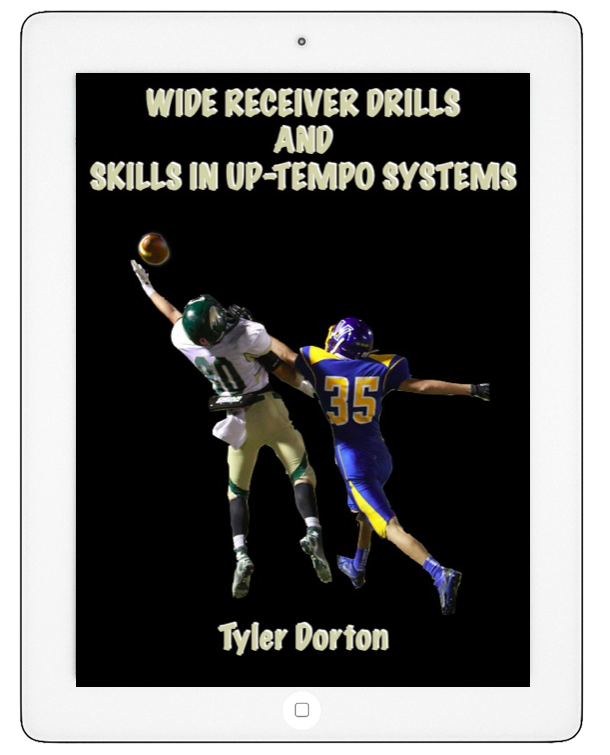 Dorton presents over 80 minutes worth of drills detailing not just what, but also the “why” behind the drills. This is an outstanding manual for any receivers coach looking to refine his players skills and teach them to be effective on game day. Explosive plays matter. 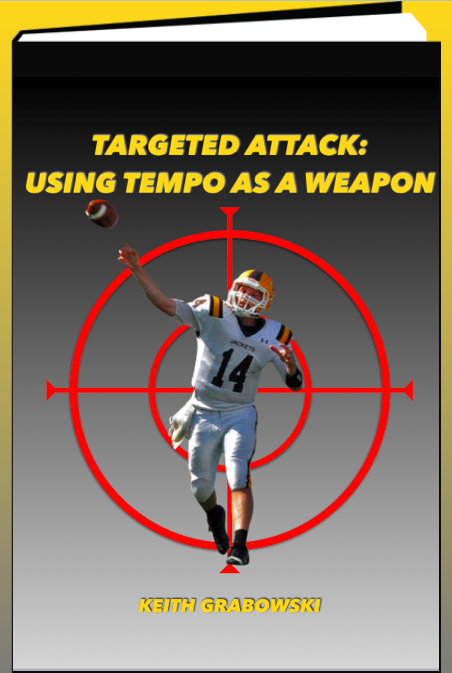 Other than turnovers, explosive plays are typically cited as the single statistic that is the best predictor of wins. Good offenses generate explosive plays. A common saying among spread coaches is “throw short to people who score.” While we certainly agree with this statement in par; unless we have an incredible talent advantage, it is difficult to be explosive if we only throw short. Some years we have fast receivers. Some years we don’t. Some years we have receivers who can make things happen after the catch. Some years we don’t. As offensive coaches we have to make sure that we give our players a chance to make plays down the field. To do this we have to find ways to manufacture vertical throws. 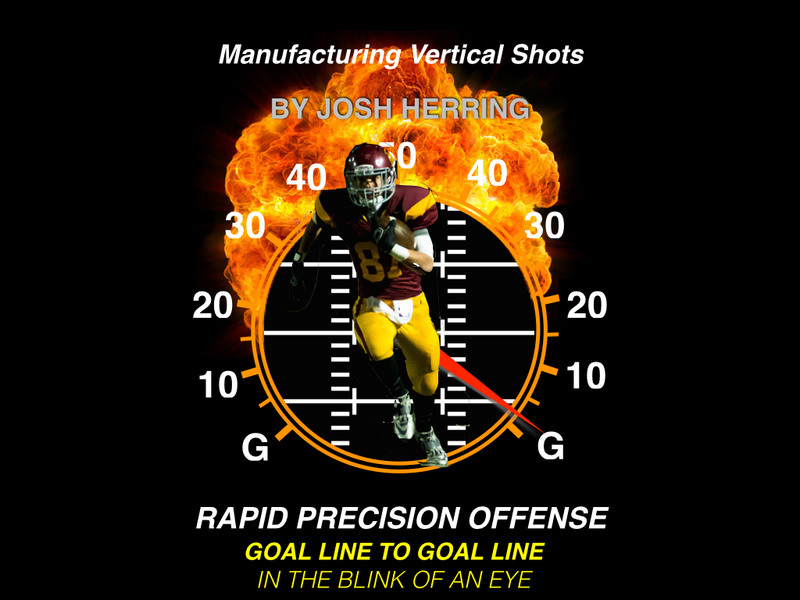 By using the term “manufacture” it should be pointed out that these ideas are created through play design, not simply by saying, “Johnny, you are faster than everyone else…go deep.” While that tactic also has its merits, and we have been blessed on occasion with that type of player, it is not the norm for us. When we create opportunities to attack vertically, not only can explosive plays be generated, but these down-the-field shots protect the rest of our offense. Safeties and corners can no longer be as aggressive in run support or in robbing short patterns and eliminating quick underneath completions. In a previous work for Coaches Edge Technologies entitled Quick Rhythm Option Routes, I discussed in great detail two routes packages we feel are cutting edge and applicable to many different offensive systems. Both packages are ball-control passes that can get the ball out quickly but also provide the potential for big plays. We will look at a variety of methods we have used to engineer explosive passes. 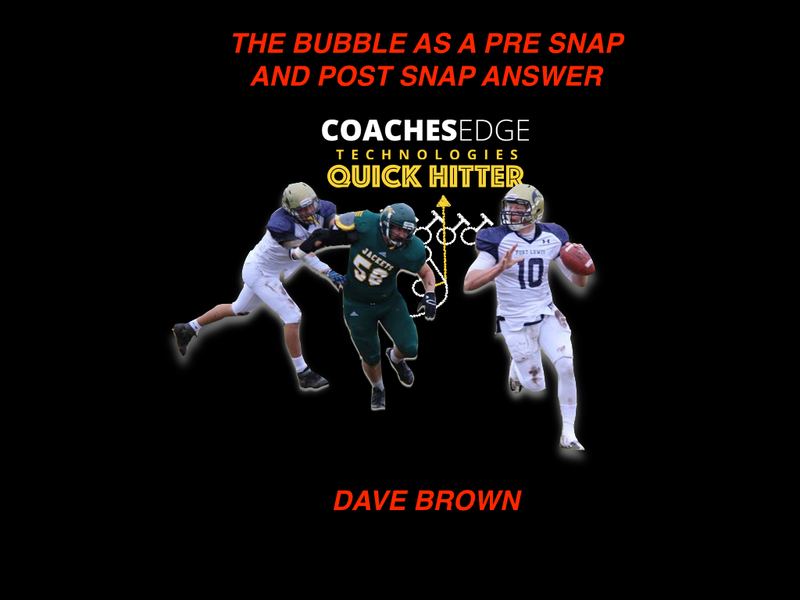 These passes are designed to create explosive play opportunities every time they are called, not just in the hope of the defense missing a tackle or a receiver making a great run after a catch. The hope is that even when they are unsuccessful, these ideas can still put a defense on its heels. In 2007 I fondly recall our team throwing the ball all over the field on nearly every snap. We had a record-breaking quarterback who was a four-year starter and a veteran, physical offensive line. We had two outstanding receivers who both went over 1,000 yards receiving, complemented by numerous role players who could block and catch the football. Over 50% of our passing game was three-step gun dropback passing, often down the field with intermediate and vertical throws. At that time, in rural North Alabama, very few teams threw the ball more than ten times a game. 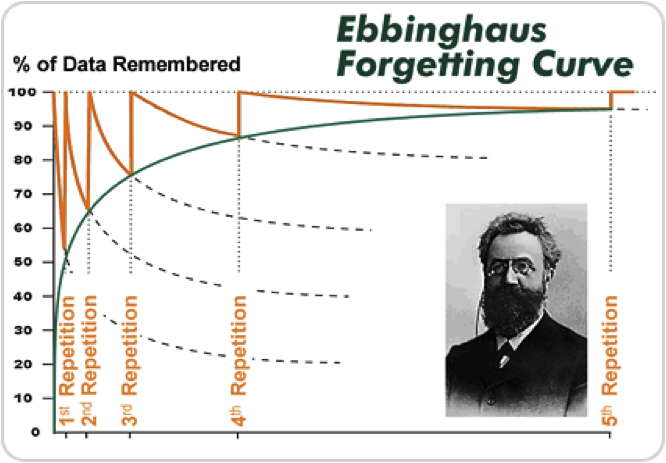 Coverages were extremely basic. A jailbreak screen had a high likelihood of scoring if called in any given passing situation. For a “passing team” those were the days. Things have changed. Currently (at least in our state), most high school coaches have more time with their kids than college coaches. Most teams practice all summer after a ten-practice spring training period. High school teams participate in off campus OTAs with other teams during the summer which closely resemble the NFL training camp model. Defensive tactics have advanced at an alarming rate. In a given season we will typically see the following: base 4-2, 4-3, 3-3, and 3-4 fronts (often with multiple combinations in the same game), blitzes not just from inside and outside linebackers but cornerbacks and safeties, and a dizzying array of pass coverages, including complex split-field combo coverages like those favored by the University of Alabama and TCU. Pass rushes are better. Defensive backs are better. Blitz schemes are more exotic. Coverage schemes are sounder, better taught, and refined through countless repetitions in summer 7-on-7 competitions. Against better competition, if we intend to dropback pass 30 or more times a game…our QB is in for a very sore Saturday morning. Team A was almost exclusively a 2×2, 10 personnel spread team. When they started spreading people out, they found that it emptied the box, and they could run zone read effectively. They had a very basic passing game and protected their read option running game with bubble screens. Team B was good on defense. They played a 4-3 Cover 2/4 defense. They apexed their outside linebackers to collapse on the zone read and still stressed the passing game. The outside linebackers were athletic and could cover. When Team A threw bubbles and quick game to constrain the outside linebackers, Team B was in cover 2 and take it away. When Team A became frustrated, they tried to throw four verticals. Team B converted from cover 2 to cover 4 due to their read system and matched all four vertical patterns. Team A could find no rhythm on offense. They moved the ball at times but had difficulty creating explosive plays. Team B was perfectly content in allowing Team A to throw bubble screens for 4 yard gains. In the red zone, Team B clamped down time after time and ended up winning a close game. In a clinic talk in 2009, I heard Mark Hudspeth remark that he had learned that a spread team, if always in a 10 personnel 2×2 spread look, is giving the defense the best of both worlds. They can rally 7 and perhaps even 9 defenders against the run and drop 7 into coverage. By relying only on box counts (or to use a more current innovation as an example – run pass combos), the defense can often dictate. We believe there is a lot of truth to this. We don’t want to be forced to check the ball down all game. While our enthusiasm about run-pass combos is as devoted as anyone’s, there are times when we need “attitude” plays even as a spread offense. We want to attack on every snap, whether in the run or pass game. One of the things we hope to show is that teams which operate in a spread environment can use simple tweaks such as tight-end /wing sets and multiple personnel to benefit the rest of their offense without being overly complex. For instance, it can be surprising how defenses respond to a two back set when playing a “passing team.” We might even be in 10 personnel, but simply by aligning with a receiver in the backfield, we may automatically check to an 8 man front. We are committed to trying to take a minimum of two downfield attempts per quarter. In our way of thinking, down-the-field throws are constraint plays like screens. We must throw them even when they are not working, because even when they aren’t working….they are. Even unsuccessful screens can tire out a defensive line and make defenders run from sideline to sideline. In a similar way, attacking downfield makes defensive backs (and coordinators) nervous. Even an attempt that falls incomplete can create space for the short to intermediate passing game and make fast-filling safeties hesitate just a little more before committing to the run. As a “spread” offense we have realized that changing personnel and/or using “pro-style” formations does not mean we have to change anything about our philosophy or scheme. We are not going to be “put in a box” as to our style of offense. While the ideas here are going to be shown as applied in a spread environment, most of them are applicable in any offense. We have divided our deep ball package into a variety of categories. Some are “attitude” plays where we are attempting to assert our authority and dictate to the defense. Others are constraint plays that protect other parts of our offense. We should note that in no way is this work a comprehensive study in attacking vertically down the field. We certainly are not arguing that any of these methods are the best way to take deep shots. The best way is what works for you. Instead, we will look at applications within our offense and the thought processes that led to them. Hopefully this will provoke thinking and reflection about how your own offense can adapt to attack vertically. Our hope is that in presenting our philosophy and methods, you can find something of use for your offense, regardless of system.